In a large skillet, brown ground beef hot oil. Add remaining ingredients. Simmer for 10 minutes. Drop parsley biscuit topping over hot mixture in skillet. Bake in a 425° oven for 20 minutes. 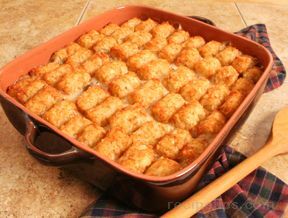 Carefully turn casserole out onto a large platter. 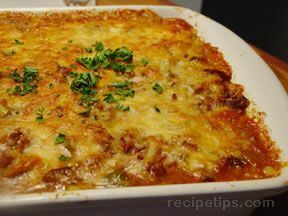 Cut in wedges and serve immediately. Sift dry ingredients into bowl. Cut in shortening with pastry blender or two knives. Stir in parsley and milk, only until flour is moistened. 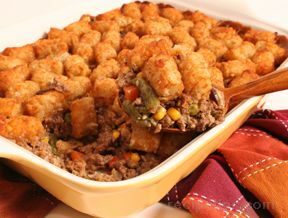 Drop onto hot ground beef mixture and bake as directed above.